The derailer is the thing that moves the chain from one gear to another. 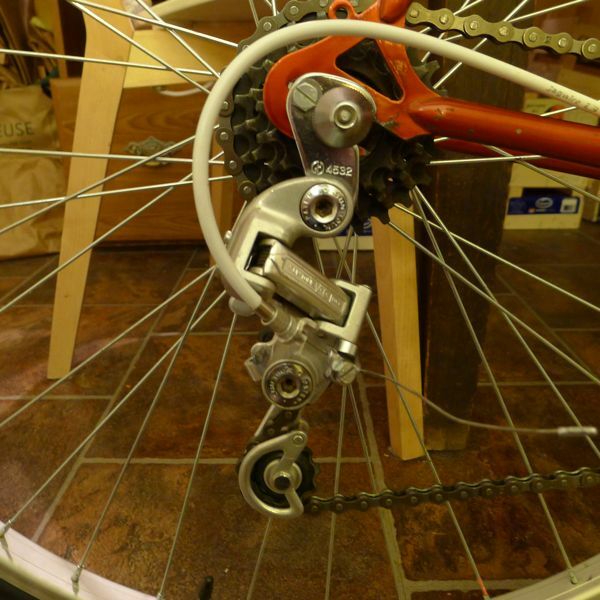 Front derailers are very simple, but rear derailers are more complicated for several reasons. When I bought the bike, the guy had set it up as a single-speed, but he gave me the original rear derailer, a Huret Allvit. It turns out this is a somewhat historic derailer,** but it was also nearly 50 years old and wasn’t working very well. After a little bit of research, I ordered a SunTour V GT Luxe on e-Bay. It was made in about 1973, so almost ten years after my previous derailer. The derailer website doesn’t list it as a “derailleur that changed the world” like the Huret, but it does call it “well loved,” and it’s descended directly from a derailer that changed the world. It turns out that in the early 1970s, SunTour figured out a simple but ingenious design innovation that makes rear derailers work way better (I’ll let you read about it at the derailer site), and for as long as their patent held, their derailers worked way better than anyone else’s. * The usual spelling is derailleur; pronunciation in English is the same. I prefer the anglicized spelling. ** One of the very best things about the internet is that by now there is an excellent site for almost any topic, including one devoted to historic derailers. Bike pr0n! Thanks for sharing this. I ride my bike a fair amount, but I haven’t the foggiest idea of how the mechanics of it work, let alone the history of the technologies involved. I spent a bit of time trying to do the work myself at a non-profit place that provides tools, stands, and techs who will assist, but then figured out that it takes less time and only a little bit more money to drop it off at a shop. Perhaps a bit lame, but there it is. I love that there is someone somewhere who has taken it upon himself to catalogue derailers and deem some worthy of special status as “world changers”. Also, yes, I’ve often been confused by the French spelling of this word. I mean, it’s not like we drive cars that have “carburateurs”, right? Why “derailleurs”? But then, I have always been something of a poseuse. You should start an agency that hires out chauffeuses, if you’re such an entrepreneuse. Under Dave’s spelling plan, I would be an entreprener. Okay, so I first encountered “derailleur” when I was like 13 or 14 and my friends and I were getting into mountain bikes, which were a fairly new thing at the time. If we’d just been riding around on 10-speeds like they did in the ’70s, we wouldn’t have cared what anything was called. Instead, we were reading these mountain bike magazines about all the new components that were coming out. And because “derailleur” is spelled Frenchily, we (having no one to correct us) pronounced it in a kind of midway-between-French-and-English manner. We were not cultured, and we sounded super awkward. 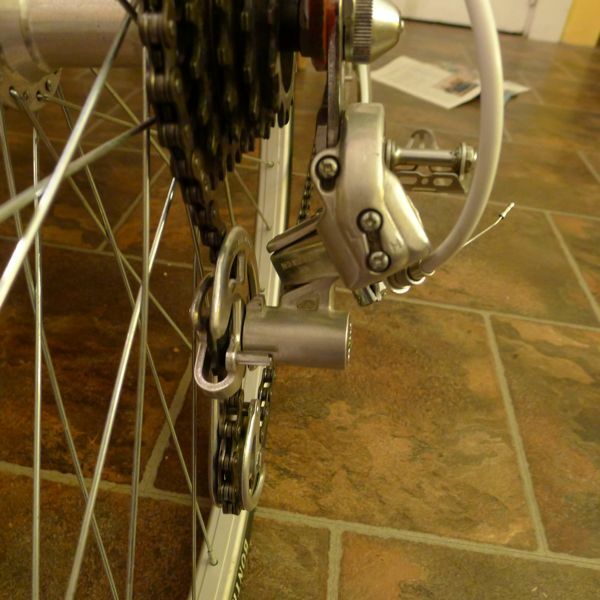 As it turns out, “derailleur” is pronounced by Americans as “derailer.” More like carburetor, less like entrepreneur. Meanwhile, does it surprise anyone that on TGW, a post about the mechanics of bikes gets hijacked into a discussion of spelling and pronunciation? Oh, I wanted to say that Tim should totally get into working on his own bike. It turns out to be really simple for the most part. Some things are tedious and/or require special tools (which you can borrow at a co-op like the one you’ve been to), and there are a couple of things that are genuinely difficult. But most of it is simple. And because modern bikes have such amazing engineering, you get to feel like you’re participating in some incredibly complicated project, even though you’re just adjusting a brake cable or whatever. It was all those bicycle engineers of yore who did the hard work, and you get to take the credit and have the sense of mastery over an amazing machine. I hear “de-rail’-yer” down the bike shop.